It's interesting to note that this is the premiere PVE mutilate main hand, since there are no ilvl 239 1.8 speed drops in Ulduar. The closest is Daschel's Bite, 178.8 dps, which despite having less budget wasted on stats like resilience or stamina, is likely inferior. Freya does drop an ilvl 239 dagger, but it is an offhand. 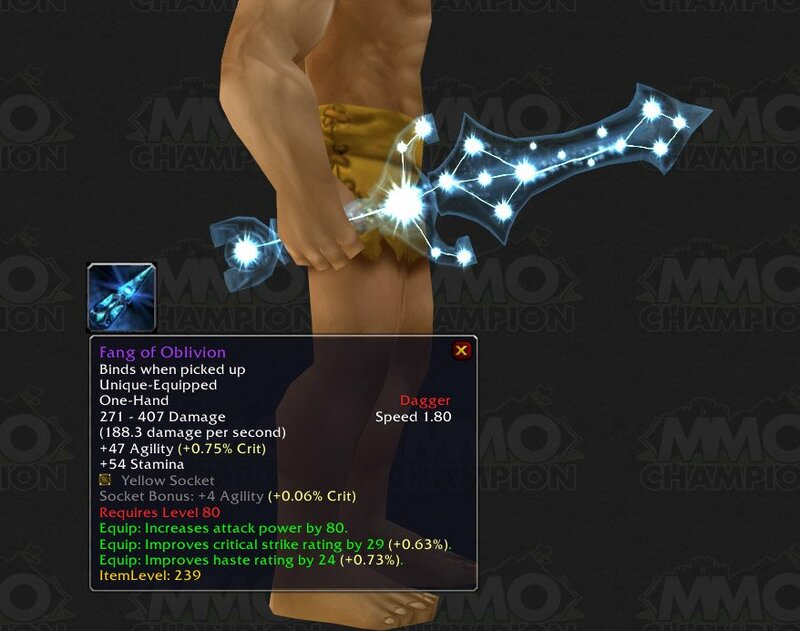 This is a darn good PvE weapon, and depending on how good you are at PvP, it may be a lot easier to get than some Ulduar daggers. I see no reason not to use this in a raid, even with wasted stats. Best damage for Fan of Knives apparently, minimum-wise. This now requires personal and team arena rating of 2350, but the tooltip wont change before patch 3.1.2. Is anybody else a little let down by the presence of a blue socket? As a rogue, I'd much rather have a red or yellow. Still nice to have pvp weapons with sockets though. Blizz doesnt want pve people to get pvp weapons and use em for pve.Thats one reason. Second is does it really matter if its better or not? Its for pvp.